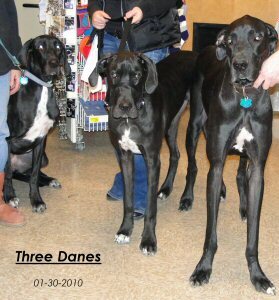 My breeder was outside a laundry mat trying to sell us (my brothers, sisters and myself) when we were just 4 weeks old. They said our mom had abandoned us and they were no longer able to care for us. Another rescue happened by and took all of us then contacted Harlequin Haven so we would receive the proper care. I have found my forever home and am a happy healthy puppy. I was adopted by a wonderful family I have a mom and a dad and even a brother Duke! Dad do I have to wear this dumb hat? Okay so it's my birthday so I should not have to wear this hat! I am going to pout! Okay for food I will wear the hat!